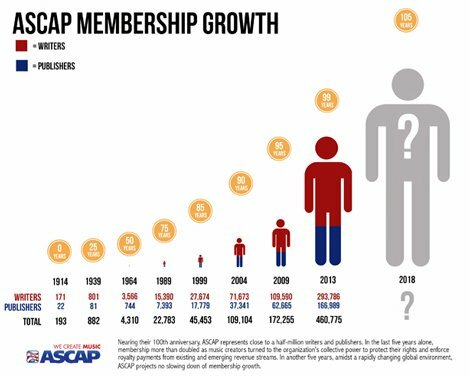 The year before it turns 100, performing rights organization ASCAP (The American Society of Composers, Authors and Publishers) is seeing a huge increase in membership. The reason for this seems to be the emergence of streaming as the fastest growing method of music consumption in America. Performing rights organizations (PROs) collect royalties for songwriters and publishers every time a song is "performed." This not only includes live shows, but music in film, television, on the radio, internet radio, and now on streaming services. The PROs collect money from anyone who would use music in a public setting, either through a "blanket license," which allows them to play any music the PRO is in charge of, or paying for only what they use. In the United States, the four PROs are ASCAP, BMI, SESAC, and SoundExchange. Songwriters and publishers join one of these organizations, and receive their royalty checks from the PRO, rather than having to follow what their music is being played on all over the country and contacting everyone, which would be impossible. The important part of this is also that it is not necessary that the songwriter is performing the song to receive royalties. If someone else plays a song they wrote, the writer would receive royalties from the PRO, while the performer would receive nothing if they did not write it. Because streaming is growing so rapidly, songwriters who depend on royalty checks to survive are finding that joining a PRO is more necessary. While many artists used to not bother joining a PRO until they had reached a certain point in their career, nowadays anyone can be streamed and they might not even know about it. Furthermore, as royalty checks from sales start shrinking, these songwriters are now looking for other sources of income. ASCAP now has a membership of 460,000. 300,000 of which joined in the last four years. BMI now has 600,000 members. Songwriters and music publishers are making sure that they won't be left out when the royalty checks get sent out. ASCAP president Paul Williams says that while traditional channels such as radio and television still pay the most, streaming is growing fast. However, royalty rates for streaming are incredibly low. While the streaming services do not disclose their royalty rates, calculations have put them at something as low as $0.006 per stream. In other words, not a huge moneymaker. But since streaming is the future, songwriters and music publishers better hope that things work out, or they've got even more problems ahead.